OK Go has released “Upside Down & Inside Out”, a music video filmed in zero gravity on an S7 Airlines plane in Russia. 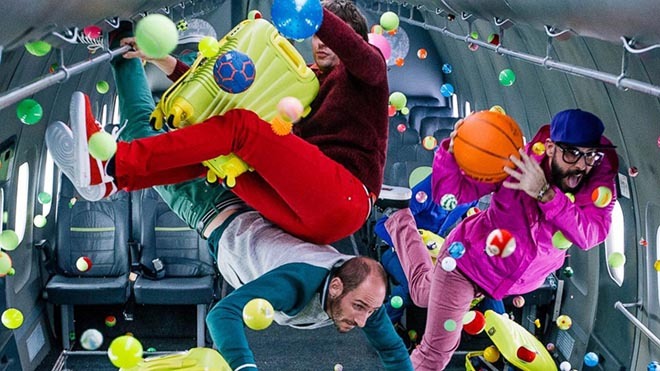 OK Go partnered with Russian airline S7 Airlines, connecting with the airline’s mission of empowering people to chase their dreams. The motto for this project was a lyric from the song: “Gravity’s just a habit.”. Released on Facebook Video on February 11, the OK Go Upside Down & Inside Out music video has already had 30 million views. It’s great timing, considering this week’s public announcement of discovery of clear gravitational wave signal, ripples in spacetime first predicted by Albert Einstein. OK Go used their YouTube channel, from February 3, to build anticipation of the Facebook video launch. This video was shot in a single take on an airplane that flies parabolic maneuvers to provide brief periods of weightlessness, sometimes referred to as or “zero gravity” or “zero g.” The longest period of weightlessness that it is possible to achieve in these circumstances is about 27 seconds, and after each period of weightlessness, it takes about five minutes for the plane to recover and prepare for then next round. Because OK Go wanted the video to be a single, uninterrupted routine, filming was shot continuously over the course of eight consecutive weightless periods, which took about 45 minutes, total. Actions and music were paused during the non-weightless periods, and then cut out these sections and smoothed over each transition with a morph. You can spot the moments in the video when we skip ahead in time because they are points when gravity briefly returns. This happens at 0:46, 1:06, 1:27, 1:48, 2:09, 2:30, and 2:50. You might notice that these moments aren’t 27 seconds apart. That’s because the song moves in musical sections that are a little less than 21 seconds long, and it was important to us that the punctuations of gravity in our routine work musically with the song. To fit the 27-second periods weightlessness into 21-second sections of music, we performed our routine slightly slower than what you see here (the song is normally 92.5 BPM, and we performed it at 72 BPM), and later sped up the footage (28.47%) to bring it back up to normal speed. Before and after each period of weightlessness, there is a roughly 20-second stretch when it feels like there’s increased gravity. These are most easily understood as the periods when the plane is throwing everyone up out of their seats into weightlessness, and then catching them again when it ends. (For a better explanation of parabolic flight, see the link above) In this video, the first scene, in which we sit waiting and then do the goofy laptop dance, was performed while we were experiencing double gravity, just before the beginning of the first weightless section. The first round of weightlessness hits at about 0:26, and you can see us all lift a little in our chairs when double gravity gives way to zero gravity. You can also see double gravity at the end of the video. When the last weightless period ends, at 3:20, the paint we’ve splattered all over the plane comes raining down with double force as we are all pressed into our seats. Can you explain zero gravity flights in normal language? Imagine throwing a coin up in the air and then catching it. While the coin is sailing through the air, the only force pushing against it (the only force it can “feel”) is the friction from the air that it’s rushing through. After it leaves your hand, even though it is still being pulled toward the earth by gravity, there is nothing but that air actually pushing directly on the coin until it lands in your hand again. So then imagine if you could throw the coin up in the air, but follow it with your hand, keeping your hand very carefully cupped around it, following the path of its flight without touching it. If your hand could shield it from the air it’s rushing through, there would be no forces on the coin at all. From inside your hand, it would seem like the coin was just floating there. In parabolic zero gravity flights, the plane acts like your hand, and everything inside the plane acts like the coin. The plane accelerates upwards, and everyone inside is pushed hard into their seats. During this period, it feels like there’s double gravity. (The coin would also feel increased gravity while your hand is throwing it). Then, once the plane has gained enough speed upwards, it stops accelerating quite so hard. Everything and everyone in it keeps sailing upwards, but instead of the plane continuing to push, it now just sails along with everyone inside it, blocking out all the wind and external forces. Gravity is still dragging everyone towards the ground, but we can’t feel it. We just follow the arc that we were thrown in (and the shape of this arc is a parabola — hence the name). So we sail up for a little bit and then level off and start dropping towards the earth. All the while, everything in the the plane, including the bubble of air around us, is flying in that same arc, so from inside the plane, we don’t feel any forces at all. Everything just floats. Of course, the plane itself is rushing through the atmosphere, and all that air outside the plane causes lots of drag as the plane races through it. This means that for the plane to keep up with us inside it, its engines need to thrust against all of the outside drag, just like your hand would have to push through the air to keep up with the coin. So, after it’s thrown everyone up and we’re all sailing weightlessly back towards earth, the plane is actually accelerating through all that outside air, and as we fall, it’s got its engines engaged, racing towards the ground. Then, like your hand catching the coin before it drops to the ground, the plane catches us. It pulls out of its dive, and inside the plane our weightless free-fall ends, and we all get pinned back in our chairs, or wherever we happen to land. Like the coin smacking into your palm, we then feel extra gravity as the plane pushes back against us. We’ve gained a lot of speed while we were diving towards the earth, and now the plane has to reverse all of that, so there’s a period of double gravity while we are leveling back out again. Then the plane climbs back up and we do it all again. The effects of zero gravity, and the double gravity you feel just before and after the weightless periods, can make people very nauseated. A lot of our crew got sick; over the 21 flights, there were 58 puke events. Luckily, this was a group of very committed adventurers, so we all soldiered through and eventually got accustomed to the crazy sensations. We were just east of Moscow, close to the the Yuri Gagarin Cosmonaut Training Center for ROSCOMOS, the Russian Space Agency, which is located in a place called Star City. It took months plan and set up, but we were actually on site near the Cosmonaut Training Center in Russia for 3 weeks. During that time we did 21 flights, with 15 zero gravity parabolas per flight, for a total of about two hours and fifteen minutes in weightlessness. For the first week we did test flights to figure out which ideas would work and which wouldn’t. How hard is it to control yourself? If you do a really cool flip once, can you repeat it? What looks cooler in zero gravity: a chain of a string of beads? Toothpaste or a shaken can of soda? How hard is it to place place a tablet in the air and just have it stay still? By the second week, we’d chosen our favorite ideas; we had our bag of tricks, and we assembled them into a routine and rehearsed it. The third week was proper shooting, we just ran the routine 8 times over 8 flights. The S7 Air Hostesses in the video – are they trained acrobats ? Where did you find them? Tatyana Martynova and Anastasia Burdina, our S7 air hostesses, are trained aerialist acrobats. It was quite a challenge to figure out what type of performers would be best to work with in these very unusual circumstances. We considered several types of acrobats, dancers, gymnasts, and swimmers, because each of those fields has some overlap with the set of skills we thought we’d need. In the end, the pair of aerialists we chose were perfect for a few reasons. First, the routines they are trained to do usually involve a lot of very fast spinning in circles, meaning that they’ve developed incredible vestibular systems (the bodily system for balance). Most people get dizzy and sick from twirling around a couple times, but these ladies can spin around like the head of a power drill and not feel a thing. Second, they really know how to control their bodies using only their own strength and balance. Gymnasts push off the floor and swimmers push against the water, but aerialists have very little to push off of, so they develop incredible skills just using inertia and balance. Third, Tatyana and Anastasia were already friends and were great at working together and coming up with their own ideas. Since so much of our process is about experimenting with things and stumbling into new ideas along the way, we were excited to find a pair of performers who could jump right in, experiment together, and help us come up with the ideas. The coolest tricks they do are all moves that they came up with themselves, or with the help of our incredible Cosmonaut Trainers. Each flight involved three pilots/navigators, eight cosmonaut trainers, and 14 film crew, including the band and aerialist dancers. , stage team Vyacheslav Vaganov, Andrey Didenko, Maxim Sazonenko, and Maxim Kuzmin. Behind the Scenes shooting, editing, and production was provided by Geoff Shelton at Hank Films. Visual effects were produced at Visual Creatures by Anne Cuizon Pendola, Ryan McNeely, Tony Banik, Dustin Bowser, and Sam Winkler.